Use a small cup or cookie cutter to cut a hole (or any shape) in the middle of the slice. Place 1 Tbsp of butter in a pan and place it over medium heat. Then, place the slice in the pan and put 1 tsp of butter inside the hole. 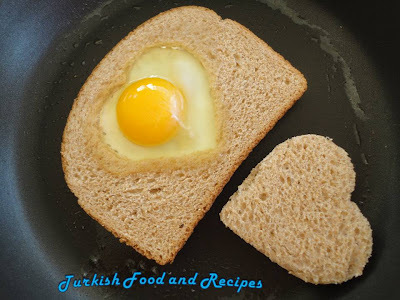 Crack the egg into a small cup and then release the egg into the bread hole gently. Or you may crack the egg directly into the hole. Sprinkle some salt and pepper. Cook for 1-2 minutes. Carefully lift up the edge and see if the bottom is nice and solid maybe a little bit of golden brownness. Flip it with a wooden spatula. Add some more butter to the pan. 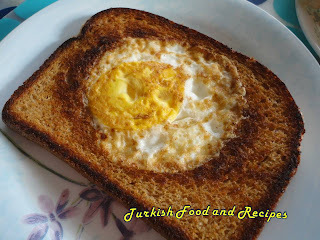 You should see the egg has been cooked nicely on side one and into the edges of the bread nicely. Again sprinkle with salt and pepper. Cook the second side about a minute or so. The second side takes a little bit less time to cook, but check and feel if the firmness is to your taste. Flip back over as the first side is typically the pretty side, and place it on your plate. Repeat the same steps for the other slices. Kucuk bir bardak ya da kurabiye kalibi kullanarak (istediginiz sekilde) ekmek diliminin ortasinda bir delik acin. Tavaya 1 yemek kasigi tereyagi alin ve orta atese alin. Sonra, dilimin ortasindaki bosluga 1 tatli kasigi kadar tereyagi koyun. Yumurtayi bir bardaga nazikce kirin ve ekmegin ortasindaki bosluga birakin. Ya da yumurtayi direk olarak ekmegin icine kirabilirsiniz. Biraz tuz ve karabiber serpin. Yaklasik 1-2 dakika pisirin. 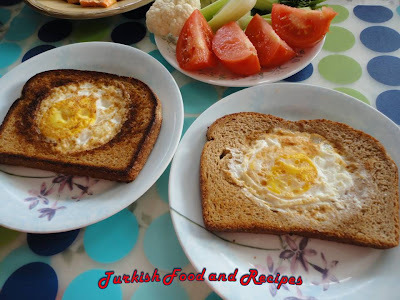 Tahta bir spatula ile dikkatlice cevirin ve tavaya biraz daha tereyagi ilave edin. Ekmegin icindeki yumurtanin pistigini ve ekmek kenarlarina dogru sertlestigini goreceksiniz. Cevirdiginiz tarafa tekrar tuz serpin ve yaklasik 1-2 dakika kadar pisirin. Ikinci taraf daha kisa surede pisecektir, fakat siz yine de arzu ettiginiz miktarda pisirin. Servis tabagina alirken ilk pisirdiginiz tarafi uste gelecek sekilde koyun, genelde ilk taraf daha guzel gorunur. Diger ekmek dilimleri icinde ayni islemleri tekrarlayin. I make this all the time... it's easy and fun and tastes good too!